The electrical grounding in older homes vs. newer homes electrical grounding in Atlanta, GA of electrical systems was originally done by connecting a heavy gauge copper ground wire, known as a bond wire, to the main water supply pipe. In those days, the main water line was comprised of galvanized steel, an excellent electrical conductor. And since this pipe extended a considerable distance below ground, it served as an adequate basis for grounding the entire electrical system. Problems occurred, however, as these old waterlines became rusted and finally needed replacement. Some of the plumbers who replaced these deteriorated lines were focused primarily on plumbing concerns, with lesser attention to the status of the electrical system. Thus, many of these water lines were replaced with PVC plastic pipe. And since plastic has no capacity for conducting electricity, grounding for those homes was effectively eliminated. There were, however, some plumbers who realized the necessity of maintaining an electrical ground when installing a PVC water main. And since copper grounding rods were not standard equipment on a plumber’s truck, the handiest substitute was a length of galvanized steel pipe, such as the ones you’ve noticed at older homes. On newer homes, grounding is provided either by an eight-foot length of half inch diameter copper rod, driven deep into the ground or by connecting a bond wire to the steel bars which reinforce the concrete foundation of the building. Some of the galvanized grounding pipes you’ve seen maybe functionally adequate, but the lengths of some of these pipes may be insufficient. When you see the exposed pipe stub next to a home, there’s no way to determine if it measures the required eight feet, or merely three feet? Furthermore, gradual rusting of the buried pipe diminishes its effectiveness as an electrical ground. For these reasons, replacement with an approved copper grounding rod is recommended wherever a ground pipe of this kind is found. 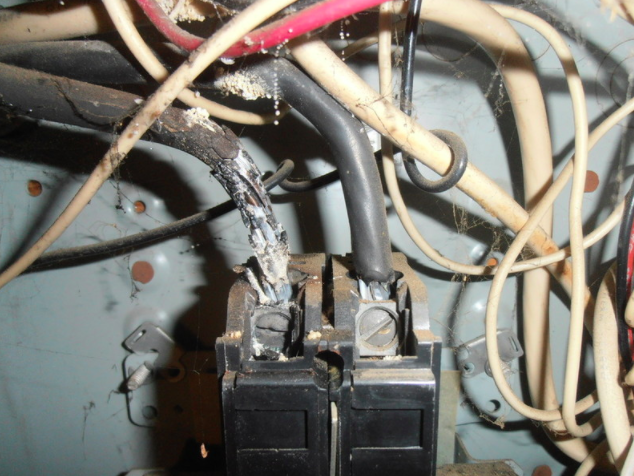 Older residential wiring is substandard when compared to current requirements. In some cases, these deficiencies warrant major changes, such as total rewiring or replacement of the service panel, but major upgrades of this kind are usually unnecessary. To best answer your question, the system should be thoroughly evaluated by a Certified Atlanta Electrician. The most common and apparent shortcomings with older electrical installation systems involve wall receptacle outlets, specifically the lack of grounding and the shortage of available receptacles. Ungrounded outlets increase shock hazards and may expose electronic equipment, such as computers, to possible damage. When outlets are the old 2-prong type, the lack of grounding is obvious. But in many homes, old outlets have been “upgraded” to 3-prong receptacles, without actually being grounded. Users are thereby given the false impression that outlets are safely wired to ground. When outlets are sparsely provided, occupants are inclined to use extension cords and other drug-store devices in ways that may overload circuits and create fire hazards. Another common shortfall of older systems is the inadequate size of the main service. Homes built before the mid-1950s were not designed for the myriad power demands we currently take for granted – i.e. dishwashers, garbage disposals, hair dryers, air conditioners, etc. In very old systems, especially those with fuses, overloading is common and upgrading the main panel is essential. Since your home was moved only 30 years ago, panel upgrades have probably taken place. If you hired a home inspector prior to purchasing this home, evidence of its age should have been discovered. Regardless of renovations, signs of vintage should be apparent to a qualified inspector. If you did not have a pre-purchase inspection, you made a major mistake – one that should now be corrected. A certified Atlanta electrician can evaluate your home wiring for problems that may arise due to the inadequate grounding of your electrical system.